Foods of Distinction. Huntington Meats is an old-fashion butcher shop featuring the latest trends and highest quality product, reasonably priced and presented with friendly service. Preheat the oven to 450°F. If the lamb is especially fatty, place rack in a large roasting pan. Lay the lamb on a work surface, fat side down, with one narrow end facing you. With a sharp knife, make crosshatch cuts into the meat about 1/2 inch deep. Season lightly with salt and pepper, and spread the olives and feta over the interior surface, leaving about one-third uncovered at the far end; scatter with the mined garlic and mint. Beginning with the end closest to you, roll the lamb firmly. Tie every 2 inches with kitchen twine to make a tight cylinder about 4 inches in diameter at the thickest point. Pat the outside thoroughly dry. Brush all over with a little olive oil and season generously with salt and pepper. 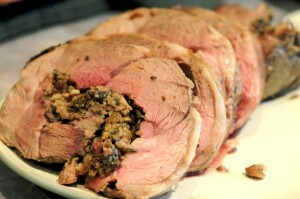 Place the lamb in the large roasting pan, and roast in the hot oven for 25 minutes. Lower the oven temperature to 300° and add the white wine and broth to the pan. 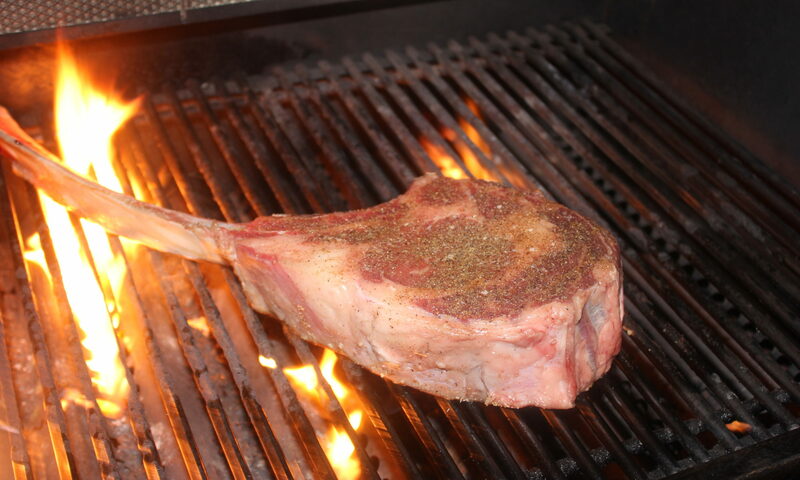 Continue roasting until an instant-read thermometer inserted into the meat registers 155°F, about 30 to 40 minutes more. Transfer the lamb to a cutting board, tent loosely with aluminum foil, and let rest for 10 to 20 minutes. Carefully tip the roasting pan and spoon off the fat. Place the pan over medium-high heat and simmer briskly to reduce the liquid by about half, around 5 minutes. Taste and adjust salt and pepper. Remove the strings from the lamb and carve into thick slices. Serve at once, moistened with a spoonful of the pan juices. Scatter the mint sprigs over the top, and enjoy!